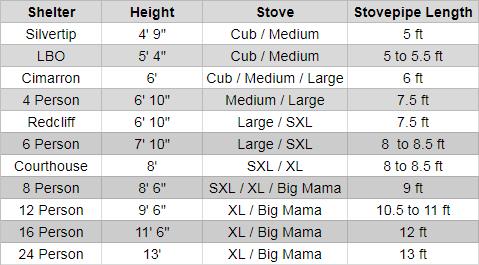 The above chart ballparks most shelter, stove, and pipe combinations. If your use runs into bitter cold, size up on stove. Pipe lengths can vary a bit. A shorter pipe is lighter and better in high winds. A longer pipe draws better but is more susceptible to high winds.